The Mt. Kenya National Park now holds the world record for the world’s highest via ferrata at 4,985m/16,355 ft above sea level. The new via ferrata which officially opened on the 9th of July 2012 on Mount Kenya by the Kenyan Wildlife Services (KWS) provides a safe passage on the Northwest approach to Point Lenana (via Austrian Hut), as well from the south side (Shipton). Christened “Olonana”, it is the world’s highest via ferrata, at 4,985 metres / 16,355 feet. 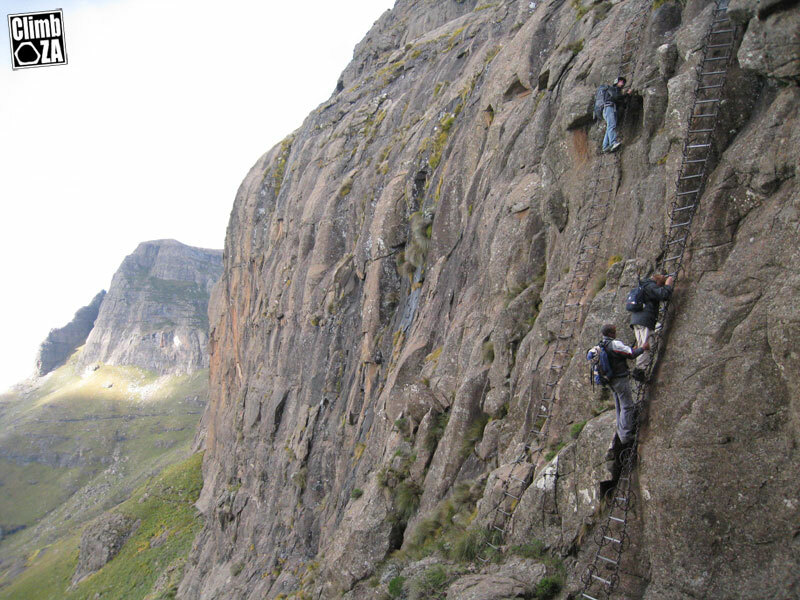 The Mount Kenya via ferrata knocks Mount Kinabalu (3,800 metres/12,500 feet) as the world’s highest via ferrata. Via ferrata (Italian for “iron road”) is a mountain route equipped with cables and metal bars that are negotiated using a harness and a tether. Climbers are clipped into steel cables providing safe method of climbing the mountain and allowing them to comfortably enjoy the spectacular scenery in a safe and secure setting. Mt. 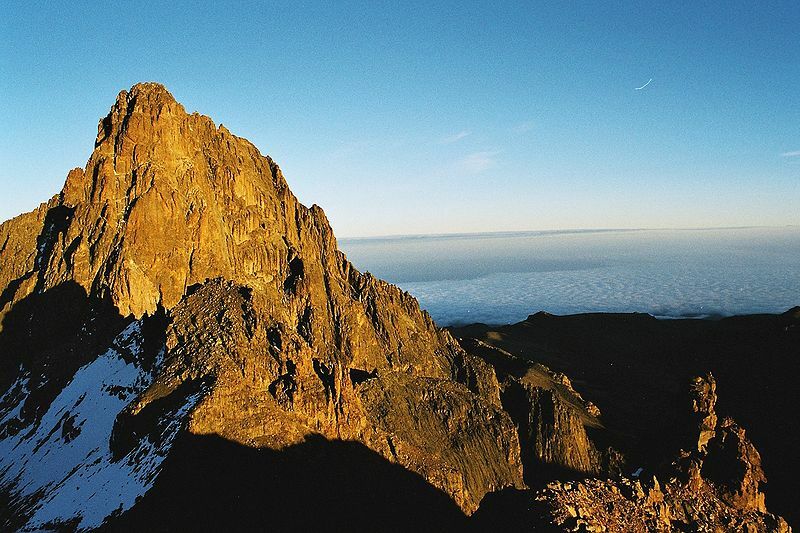 Kenya’s several peaks include Batian, Nelion and Point Lenana, of which, Point Lenana is easily accessible though challenging as a glacier has receded over due to global warming. To mitigate this, the rst phase of the via ferrata has been erected on the challenging sections of Point Lenana as one approaches the summit either from Shipton camp or Austrian hut on the Naro Moru route. The construction of the via ferrata, which is a Kenya Wildlife Service flagship project under Vision 2030, will open up isolated and difficult routes for both novice and experienced climbers. This will allow climbers to go higher and further while making mountain climbing more interesting by increasing accessibility for climbers with a wide range (read lower) of climbing ability. Walkers and climbers can now follow the via ferrata without using their own ropes and without the safety risks associated with scrambling and climbing. The via ferrata ensures that a climber is continuously secured and in case of a fall the chances of injuries are minimized. The via ferrata will also encourage visitors to engage in diverse recreational activities other than focusing solely on mountaineering activities. Mt. Kenya National Park boasts of a variety of recreational activities including hiking, bird watching, camping, picnicking and wildlife viewing. The chain ladders en-route to Mont-Aux-Sources - a guide helps a tourist on the right. ort between Rift Valley Adventures, Mountain Education Group of USA and Kenya Wildlife Service. UNESCO inscribed Mt. Kenya as a biosphere reserve in 1978 and a World Heritage Site in 1997. The mountain has been described as one of the most impressive landscapes in Eastern Africa with its rugged glacier-clad summits, Afro-alpine moorlands and diverse forests that illustrate outstanding ecological processes. ****Please note that there has been a recall on different brands of Via Ferrata sets (by numerous manufacturers). check that any via ferrata sets you own are not covered under a recall notice. other sets that are not subject to recall as of yet, may be affected. the concern relates to intensively used sets with an elasticated lanyard construction: use caution if using either personal or hired sets meeting these criteria. if in doubt contact the manufacturer to check for the latest information. If they really want to attract visitors they should clean up the rubbish piles at the huts and camps and insist empty water bottles are carried out. Trying to enjoy the mountain from the middle of a rubbish heap is not pleasant. Hmmm… because via ferratas are intrinsically safe and their use is risk free because everyone who uses it will have the correct equipment. Or not? climbers and walkers ? i can only use my right arm, can I get up there ? i have climbed Kili and ran down with the porters. climbed lots trad up to 13 in CT. will love to give it a go.